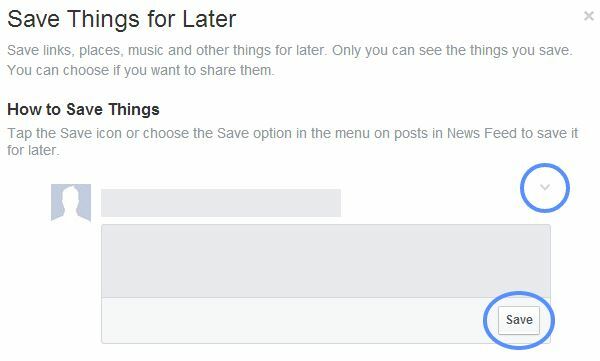 Facebook just rolled out a new "Saved" feature yesterday that allows Facebook users to save links, articles, places and things to a list that can easily be accessed at a later time. I personally really like the added feature and think that it creates an advantage for companies who post content to their own website. With apps like Pocket and Instapaper, it's evident that many social media users don't have time to read articles or watch videos the very minute that they come across them. Often times people will save these links to a file that they can revisit later when they have more time, like for example, while watching TV at night, laying in bed or waiting at the doctors office. The "Saved" feature creates an opportunity for potential customers to visit your website at their convenience. Let's say you share a link with info on an upcoming concert for the music venue that you work for. Someone who is in the middle of their work day may not be able to read all of the information on the concert at that time but will be sure to revisit the link later that evening when they have time to make a decision to purchase tickets for the event. Without the Saved option, due to time constraints, the Facebook user may have scrolled past the post and forgotten all about the concert. 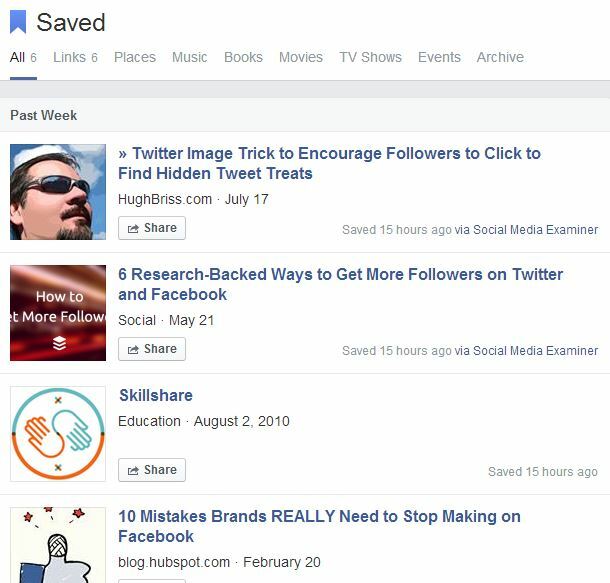 Therefore, the Saved feature creates an opportunity for Facebook users to view and share content at their own leisure. Cool, right? One thing I have noticed since the new feature debuted is that only links that are posted using the Link Preview can be saved. The Link Preview is automatically populated when you post a link within the Status Update box on your Facebook page. If you create a status update with a photo and then also add a link without the Link Preview then your link will NOT be able to be saved by Facebook users. This is something that should be taken into consideration when posting links to your Facebok page from this point forward. If you want users to be able to revisit your blog posts or website at a later date, you must use the Link Preview, which unfortunately doesn't always garner the most reach. I believe this rule also applies to Facebook Ads with the Link Preview as well. When you see a post that you would like to save to your list, simply click on the Save button within the post or click on the pull down menu at the top of the post. Then click "Save to Your Saved Links". Click on the Saved option in the More menu. On your mobile phone the More menu is located at the bottom right of the screen. On a laptop the Saved list is on the left hand side of the menu below your Friends List, Events and Nearby Places. On mobile you can manage your saved items by swiping each saved link to the left. This gives you the option to archive the saved link. share it within a new Facebook post or view the original post. All links that are saved are also categorized by Links, Places, Music, Books, Movies, TV Shows and Events.